These handmade setta sandals are of the best Kyoto quality. 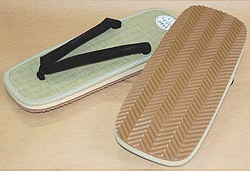 Made of tatami-style woven straw in two panels with black velvet thongs and sponge rubber soles. They come in several sizes that fit a range of shoe sizes. Note: the style of sole may vary depending on the distributor. These handmade setta sandals are of the best Kyoto quality. 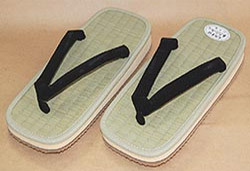 Made of tatami-style woven straw in two panels with black velvet thongs and sponge rubber soles. The soles use EVA, the environmentally friendly expanded rubber used as a shock absorber in sports shoes. They come in several sizes that fit a range of shoe sizes.